Many years ago, a good friend of mine lent me a copy of Looking for Langston – a film by Sankofa Film & Video Productions, directed by Isaac Julien. This friend thought the film the best thing since sliced bread. I have to say that I definitely remember being very disappointed by the film when I finally got round to watching it, and thought it rather pretentious and laboured, despite the beautiful cinematography. I couldn’t for the life of me think why he was so keen for me to see such a film. I haven’t seen it since then (it must have been at least twenty years ago) but I expect that my metamorphosis from architect to actor/writer in the meantime might make me more appreciative of it as a piece of art. That is quite likely because a previous artistic prejudice I had had has recently been exposed as nothing short of ridiculous. I have never been one for attending art exhibitions, or following, studying, buying or collecting art, like many people I know do. In fact, I readily take my place among those who say “I don’t know art, but I know what I like.” From the little I knew of the Turner Prize, I thought that it was as much of an excuse to shock people like me as it was to celebrate edgy contemporary British art. I dismiss quite a bit of modern art in the same way as I dismiss much of modern “classical” music. For that reason, despite the fact that a black man won the prize some years ago for a piece of film, I not only didn’t bother to see the prize-winning work (believing it would not appeal to me), but I also ignored his subsequent work, despite the fact his films were rather celebrated. However, I felt compelled to see his latest offering, and realised there and then that I was indeed guilty of the prejudice that I accuse many others of, because that film maker was Steve McQueen, and the film I saw was 12 Years A Slave. I would point out in my defence that I led a standing ovation at the end of that film (something rare outside my theatrical circles, I believe) and said to my friend (he who had lent me the Langston Hughes film) that this film deserved every Oscar going. I’m glad to be able to say that in this case, I clearly recognised genius for what it was, despite earlier prejudices. Imagine my excitement therefore when it was announced in November that Steve McQueen’s next feature film was to be a biography of Paul Robeson, whose life story literally took over my own life and led me to give up being an architect to become a playwright and performer of what is now a long-running, award-winning one man play, Call Mr Robeson. Over the last seven years, I have performed it all over the UK, in Ireland, the US, Canada, Nigeria and Jamaica to date, with performances in Australia and New Zealand coming up in 2015. 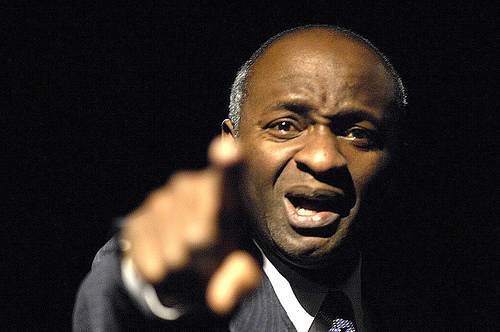 Imagine my excitement too when back in August 2013, while on tour with Call Mr Robeson in Canada, when an email arrives in my inbox from Matthew Rooke, artistic director of the Maltings Theatre in Berwick-upon-Tweed in Northumberland, asking if I would be interested in creating something around Langston Hughes, since my performance of Call Mr Robeson in his theatre there had been so successful. I had read Hughes’ brilliant biography by Faith Berry, as well as Hughes’s autobiography The Big Sea in the meantime, and developed a huge admiration for the man and his work, so this suggestion came as an incredibly pleasant and welcome surprise. Rooke’s idea was to celebrate Hughes’ words, and work with a jazz band – and the first thing I did was to order a few books by and about him. What followed was a few months’ absolute joy, reading of all sorts of things by Hughes – poetry (including relatively rare works) articles, short stories and plays. In Call Mr Robeson I concentrate as much on his radical politics as on his music – introducing most people to that side of Robeson for the first time – and I wanted to do the same with Hughes. This was not difficult, as he had been radical (and therefore poor) for practically all his career – his colour and the society in which he lived made it almost impossible for him to be otherwise. The more difficult task was to decide on just which works to feature, and what songs to sing, being more of classical baritone than a jazz singer in the first place. With coaching from a good friend, Louise Gibbs, an excellent jazz singer and teacher, I overcame my fears and was able to come up with a very interesting programme of songs for the piece. It also included two songs to Hughes’ poems/lyrics more suited to my classical voice, with piano accompaniment. These were Death of An Old Seaman, set by Cecil Cohen, which is one of my two absolute favourite songs ever, and to finish with, an aria from Trouble Island, the opera Hughes penned with another African American composer, William Grant Still – I Dream A World, transposed from the bass register for my baritone. The Gentlemen of Jazz was the name given to the group of brilliant musicians assembled by Matthew Rooke, and we had an absolute ball preparing and premiering the show, which I titled What Happens? 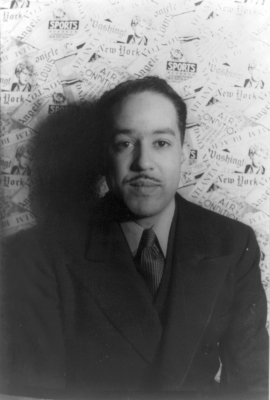 If I were to write a play about Langston Hughes, it would probably deal with some difficult subjects, one of which would be his appearance before the House Un-American Activities Committee where he somewhat capitulated to them and told them almost all they wanted to hear – that his radicalism was a symptom of a misguided youth, and he had now grown up to be a loyal American. Hughes also declined to speak up for Paul Robeson, something he was roundly and rightly criticised for by WEB Du Bois and others. This is in great contrast to Robeson himself, whose appearance before the same committee I describe as the most impressive and important performance of his career, for the way he defiantly wiped the floor with them. Because my father was a slave, and my people died to build this country, and I am going to stay here and have a part of it just like you, and no fascist minded people will drive me from it. Is that clear? We want to know what in the hell you’d say? That poem was one of the many delights awaiting me in a volume called Good Morning Revolution: The Uncollected Writings of Langston Hughes, again edited by the redoubtable Faith Berry. Its tone is typical of the earlier, more fiery Hughes than the sweeter, more sanitised, somewhat less threatening figure known today. It has been nothing less than a gift for me, a Nigerian former architect, to have been exposed in England to these two formidable African American radical artists so long after they departed this earth, and to find myself in the position of sharing their work around the world. It is a testament to their brilliance and their enduring relevance, as we watch in horror today while the nation of their birth exposes its hideous underbelly to the world as it first did in the 1950s, and as the dreams they dreamed for a better world remain sadly deferred, for now. As another hero of mine, Mumia Abu-Jamal, said in a characteristically brilliant recorded essay in tribute to Robeson: “How much such art as he produced is needed now.” This applies equally to Hughes. Come back Langston, Come back Paul. I commend this to everyone, I have no doubt Tayo was an excellent architect, )like Paul Robeson he excels in all he does), but his writing, acting and eloquence transcend all that, and I am honoured, since meeting and chatting with him after his performance in Enfield 6 weeks ago to have become a personal friend. It has triggered me to embark on a personal crusade to help restore Paul, who I also had the honour of meeting in 1949, as an outstanding figure in the fight for racial equality. He is someone of whom 97% of the African and Afro Caribbean community in this country seem to be unaware, but on the positive side, as soon as I give a little background they are, without exception, keen to follow up and learn about on the internet.